We took Hobie to the downtown Sunnyvale pet parade last weekend. 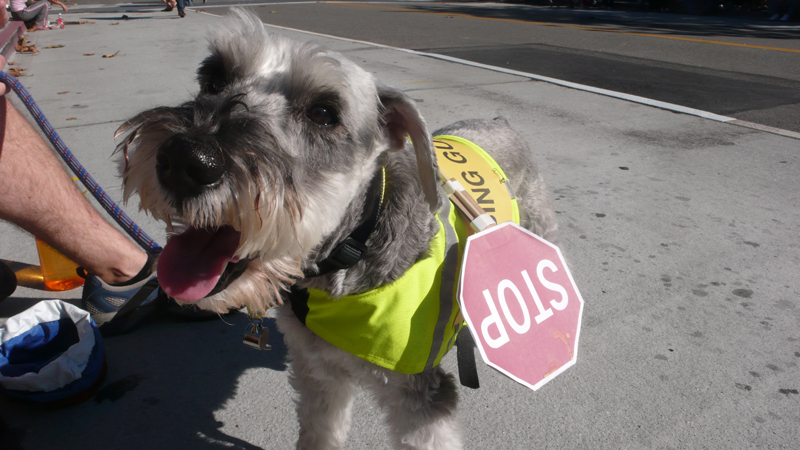 I took the opportunity to reuse his reflective vest and turned into his Halloween costume - a miniature schanuzer crosssing guard, complete with whistle and stop sign. I found a picture of the stop sign online and pasted it onto some cardboard, and sewed it onto his vest. And as one passerby commented, Hobie was a very alert crossing guard! Be safe out there tonight. Happy Halloween! This page contains a single entry by gladys published on October 31, 2009 8:35 AM. Playing molkky was the previous entry in this blog. Camping in Big Basin is the next entry in this blog.